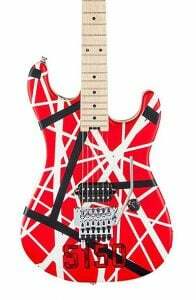 EVH Striped Series 5150 Review – A Frankenstrat Fit for a King! 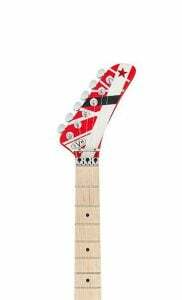 There’s no confusion when you pick up the 5150 – this is a Frankenstrat, with the distinctive red finish plastered with a stream of black and white stripes. As if you needed any extra confirmation, red hologram ‘5150’ stickers are added to the lower bout. 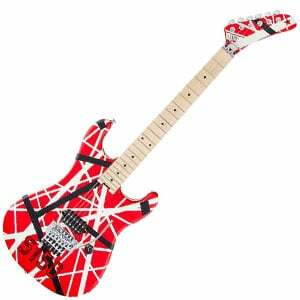 The overall design is similar to the lower-end Frankenstrat, although there are some noticeable upgrades. The comfortable double-cutaway body shape remains, with the same lightweight basswood construction. This features a bolt-on quartersawn maple neck that’s as slick as you’d expect with the modified C-shape profile and hand-rubbed finish. The gorgeous playability is enhanced by the maple fretboard with a 12” to 16” compound-radius, along with 22 jumbo frets and a nice low action. Capping this all off is the hockey stick headstock bearing the same stripes as the body and painted red on the rear. Finally, made in Mexico, this Frankenstrat shows excellent craftsmanship – not a blemish or rough fret in sight. It looks incredible and it plays perfectly – top marks here. The electronics on this guitar are the very definition of simple. Like Eddie’s original Frankenstrat, this replica sports just one pickup, nestled at the bridge position. This is an EVH Wolfgang Alnico 2 humbucker, controlled by just one single volume knob (labeled ‘tone’ as is customary on EVH signature guitars). This axe is also loaded with an excellent EVH-branded Floyd Rose bridge along with a locking nut. While this is a great system as it is – allowing for huge divebombs and whammy play while keeping your tuning rock solid – there’s another cool feature. This bridge sports the exclusive EVH D-Tuna function, which allows you to switch the low E string to dropped D tuning (and back) in a split second. A small feature, but so useful, especially when gigging. Elsewhere you’ll find a set of six precise and sturdy EVH-designed tuning machines, along with a heel-mounted truss rod adjustment thumbwheel. Sadly the 5150 doesn’t arrive with its own case, which is expected at this higher price, but it’s not a deal-breaker. For a guitar with just one humbucker, the sound is exceptional. It really offers that 1980s metal tone which we all hope for when plugging in an EVH signature. The cleans are warm, clear and quite lively, while there is huge power as the gain is ramped up. With big distortion the guitar is aggressive and punchy, but remains articulate and quite well balanced, whether you are riffing in the low end or working on your Eruption solo. Ultimately, this guitar delivers an accurate EVH tone, although works just as well for all kinds of classic rock and even modern metal. Aside from the D-Tuna feature, there are not many bells and whistles with the EVH Striped Series 5150 – it’s a high-performance workhorse of a guitar that happens to be an absolute pleasure to play. It always catches the eye and, with that powerful humbucker, the ears too. While it’s not a cheap guitar, it undoubtedly offers the best way to sound like EVH, without completely ruining your finances. For more info about the EVH Striped Series 5150, click here. For more Expensive Electric Guitar you might like, click here.